Ladies and gentlemen, my first completed crochet project! It’s a far cry from this. And this. 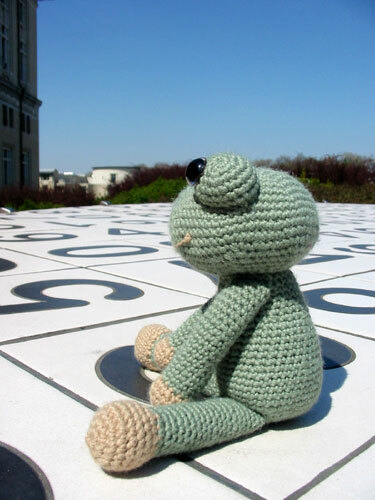 Since this pattern is titled “Frogs on a Holiday,” I thought it only appropriate that I take him out on the town for a little photo shoot. This book has a very tiny techniques section, so if you’re a beginning crocheter like me, you should have another crochet reference handy. But other than that, the pattern was very easy to follow. More pictures and commentary after the jump. There is an error in the directions for the arms—it says to fasten off after row 6. 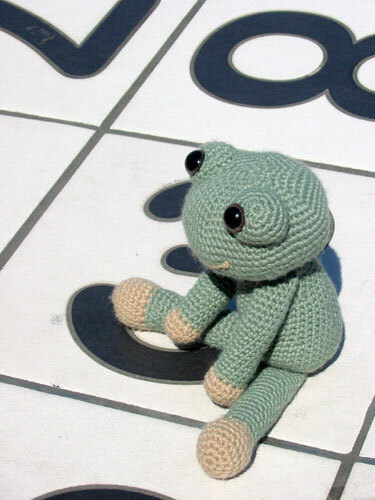 Given that I didn’t want my frog to have tiny, stubby arms, I switched to the main color at row 6 and crocheted until I had 24 rows total before fastening off. 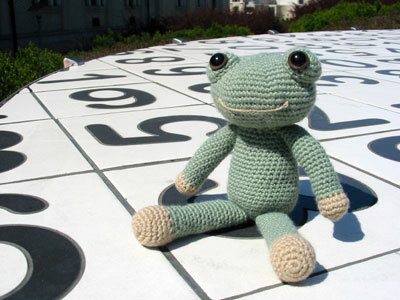 That seems to be the right length; my frog’s proportions look pretty close to the pictured samples. The assembly instructions are better than what you find for most toys, telling you how many stitches and how many rows apart different elements should be. The only bit that’s missing is about the eyes. The pattern says to position the eyes three rows from the center, but it doesn’t say how for apart they should be. I ultimately decided to set them on the front half of his head, as wide apart as possible. I’d also recommend setting the arms one row below the head joint so he has a wee neck. I discovered that sticking the arms right where head and body meet makes him look like he’s perpetually shrugging. And finally, I gave him a new mouth. It’s just a single strand of the contrasting color, anchored in place by a couple knots on the ends and an inconspicuous stitch in the center. This is much more Frog in Dickens (following KathyMarie‘s characterization) and less, y’know, Frog in Drag. One thing that’s become more apparent to me as I make more toys is that each one develops a distinct personality. This little guy seems to like to tilt his head to the side and stare longingly off into space, as if he has some Great Expectations. 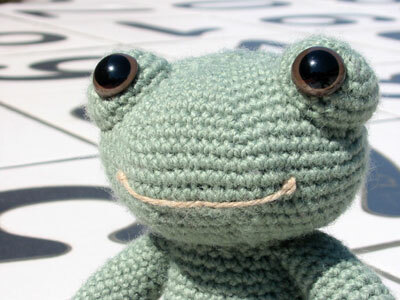 And so, little froggy, I name you Pip. 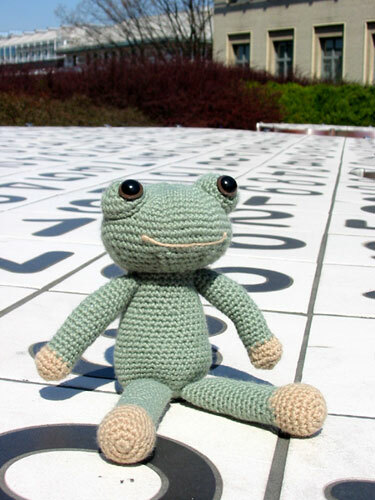 CogKnition posted this on April 18th, 2008 @ 10:17pm in Crochet, Finished Objects, Toys | Permalink to "Frogs on a Holiday"
Pip! I love it! He’s so adorable, and the new mouth is a big improvement. I like the light tan/green combination. Congratulations on your first crochet FO!